The Gadsden Purchase Treaty was an agreement between the United States and Mexico, finalized in 1854, in which the United States agreed to pay Mexico $10 million for a 29,670 square mile portion of Mexico that later became part of Arizona and New Mexico. Gadsden’s Purchase provided the land necessary for a southern transcontinental railroad and attempted to resolve conflicts that lingered after the Mexican-American War. While the Treaty of Guadalupe Hidalgo formally ended the Mexican-American War in February 1848, tensions between the Governments of Mexico and the United States continued to simmer over the next six years. The two countries each claimed the Mesilla Valley as part of their own country. The Mexican Government demanded monetary compensation for Native American attacks in the region because, under the Treaty, the United States had agreed to protect Mexico from such attacks; however, the United States refused to comply, insisting that while they had agreed to protect Mexico from Native American attacks, they had not agreed to financially compensate for attacks that did occur. The persistent efforts of private American citizens to enter Mexico illegally and incite rebellions in an effort to gain territory exacerbated tensions between the governments. These continuing tensions between Mexico and the United States complicated U.S. efforts to find a southern route for a transcontinental railroad as the only viable routes passed through Mexican territory. In 1847, the United States attempted to buy the Isthmus of Tehuantepec, an isthmus on the southern edge of North America, as an alternative means of providing a southern connection between the Atlantic and Pacific oceans. Mexico, however, had already granted Mexican Don José de Garay the right to build colonies for Americans on the isthmus with capital from the New Orleans Company. Fearing the colonists would rebel (as those in Texas had rebelled), Mexican President Juan Ceballos revoked the grant, angering U.S. investors. In 1853, Mexican officials evicted Americans from their property in the disputed Mesilla Valley. When the U.S. Government did not act, Governor William Lane of New Mexico declared the Mesilla Valley part of the U.S. territory of New Mexico. Mexican President Antonio López de Santa Anna (aka Santa Anna) responded by sending troops into the valley. Attempting to diffuse the situation, U.S. President Franklin Pierce sent James Gadsden, the new U.S. Minister to Mexico, to negotiate with Santa Anna. Secretary of State William Marcy instructed Gadsden to renegotiate a border that provided a route for a southern railroad, arrange for a release of U.S. financial obligations for Native American attacks, and settle the monetary claims between the countries related to the Garay project. Gadsden met with Santa Anna on September 25, 1853. President Pierce sent verbal instructions for Gadsden through Christopher Ward, an agent for U.S. investors in the Garay project, giving Gadsden negotiating options ranging from $50 million for lower California and a large portion of northern Mexico to $15 million for a smaller land deal that would still provide for a southern railroad. Ward also lied to Gadsden, stating the President wanted the claims of the Garay party addressed in any treaty concluded with the Mexican Government; however, President Pierce never gave Ward these instructions because he did not believe in government involvement in affairs between private companies and foreign governments. 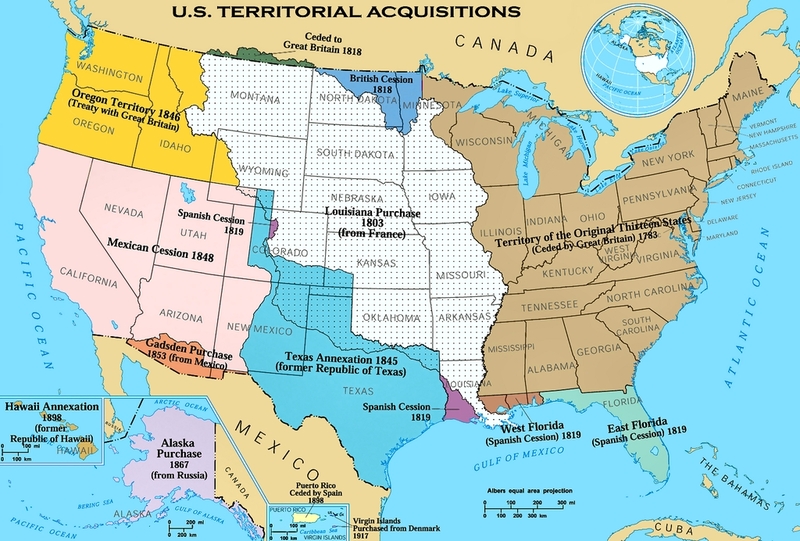 Santa Anna refused to sell a large portion of Mexico, but he needed money to fund an army to put down ongoing rebellions, so on December 30, 1853, he and Gadsden signed a treaty stipulating that the United States would pay $15 million for 45,000 square miles south of the New Mexico territory and assume private American claims, including those related to the Garay deal. The United States Government agreed to work toward preventing American raids along Mexico’s border and Mexico voided U.S. responsibility for Native American attacks. With a great deal of difficulty resulting from the increasing strife between the northern and southern states, the U.S. Senate ratified a revised treaty on April 25, 1854. The new treaty reduced the amount paid to Mexico to $10 million and the land purchased to 29,670 square miles, and removed any mention of Native American attacks and private claims. President Pierce signed the treaty and Gadsden presented the new treaty to Santa Anna, who signed it on June 8, 1854. 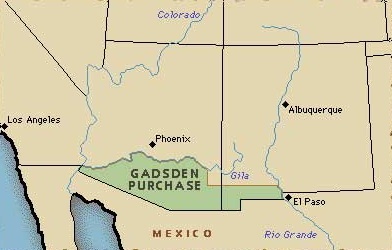 After Gadsden’s Purchase a new border dispute caused tension over the United States’ payment, and the treaty failed to resolve the issues surrounding financial claims and border attacks. However, it did create the southern border of the present-day United States, despite the beliefs of the vast majority of policymakers at the time who thought the United States would eventually expand further into Mexico. Remembering the Alamo won't be a problem after you've seen The Alamo, a richly informative, thematically unified set of four History Channel documentaries. The centerpiece of this two-DVD set is "Remember the Alamo," hosted by Dennis Quaid and produced to coincide with the April 2004 theatrical release of The Alamo, the historical epic (promoted here in a behind-the-scenes featurette) in which Quaid plays Gen. Sam Houston. It's a typical History Channel production, purporting to offer the definitive fair-and-balanced account of the siege on the infamous San Antonio, Texas mission on the chilly morning of March 6, 1836, between the Mexican centralist army of Gen. Santa Anna, and the "Texican" American rebels led by Davy Crockett, Jim Bowie, and William Barret Travis. Numerous "talking head" scholars pore over new and established historical details, examining the political and geographical circumstances that led to the massacre that left few survivors, and dispelling such myths as Crockett's fate (he was captured and executed) and the number of Mexicans killed in the assault. Behind the most famous battle cry in American history is a story of ambition and heroism, greed and vanity, desperation and defeat. THE HISTORY CHANNEL® PRESENTS: THE ALAMO examines the epic battle through four acclaimed programs from THE HISTORY CHANNEL® and A&E, presenting a compelling picture of the forces, personalities and events that converged at the San Antonio mission in 1836. "Remember the Alamo" New research dispels some long-held beliefs about what really happened in the showdown between Santa Anna's army and Davy Crockett, William Barret Travis, Jim Bowie, and their group of American volunteers. "The Real West: The Battle of the Alamo" Host Kenny Rogers focuses on the strained collaboration among Davy Crockett, Jim Bowie, and William Barret Travis. "The Real West: Texas Rangers" Ride into the past to see how these legendary lawmen patrolled a vast and wild territory. "BIOGRAPHY®: Davy Crockett: American Frontier Legend" Experts explode the myths surrounding the backwoodsman who died at the Alamo.